Facility: toilets, tables, quite a walk to the entrance with a small wooden platform and stairs for easy entry and exit. A caretaker stays at the cenote during the day. The owner has brought many dogs to the cenotes over the last years and left them alone there during the night. As the property is not completely fenced, many have been hit by cars or they die a wretched death as they do not get any veterinary care if needed. Our rating ranging from ∇ (bad) – ∇∇∇∇∇ (excellent) therefore is: ∇ (bad). This cenote is a typical sinkhole meaning it is a round shaft going down. The collapsing roof piled up a heap and peeps of of the thick hydrogen sulfide layer. This layer is stuck between fresh and salt water and shuts all day light out once we descend into it. This composition of “clouds” and island in the middle makes me feel to be a sky diver gliding down. 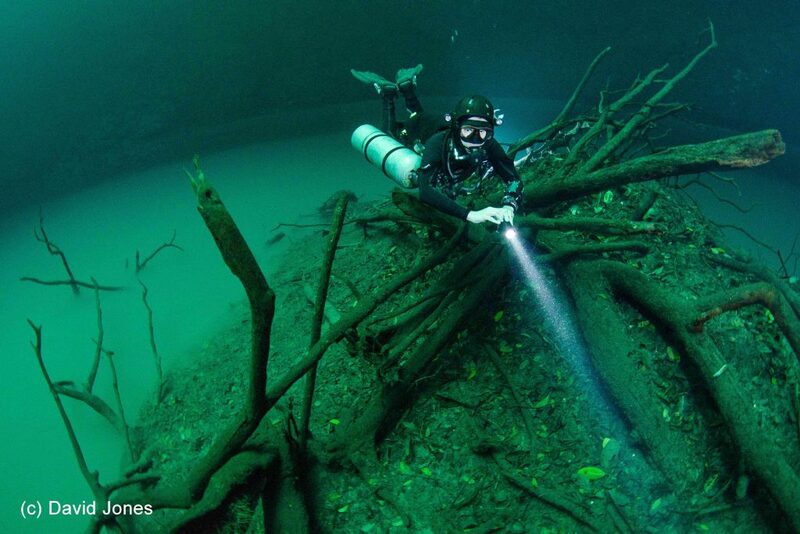 Cenote Angelita is not a beginner dive, because of depth and the whole dive profile. We have a freewater descent without reference as visibility in the surface area is never great. We also have to monitor our non-decompression limits closely but once you get your dive going, the buoyancy is set and you look around, once again, you will say that this is something truly special and worth every effort getting there.